One year ago I went to Paris for a week and I fell in love with the city. I think I saw almost the whole city in a week and it's just a magical and perfect one, it has it all. I really want to go back someday. The next place I want so visit so bad is Berlin. I have been wanting to go to Germany so many years, another city I want to visit is Hamburg... Germany is one of my favourite countries so far. 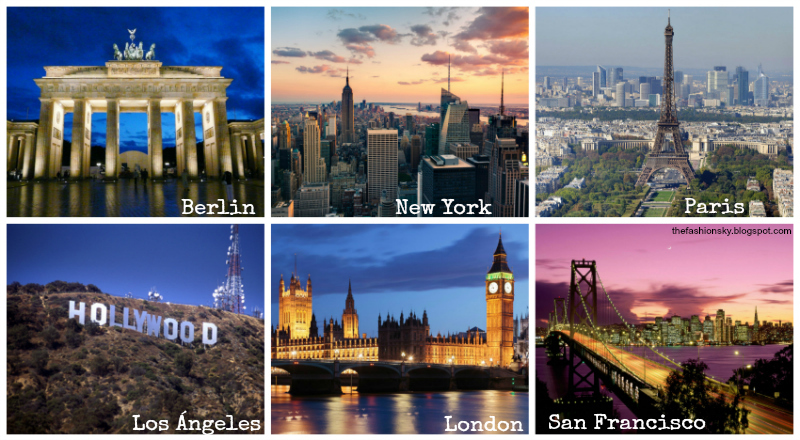 New York and London are two of my fav ones as well and I think they are must-see cities. I really hope to go there someday soon! And last but not least: LA and San Francisco. Who doesn't want to see the sunset in LA at least once in their life? Who doesn't want a photo with the famous Hollywood sign? Or at least see it? And who doesn't want to see or walk through The Golden Gate Bridge? Definitely, I want/need to travel! me too, i want to visit NY and LA , and i want to go again to Paris and London!!! I am moving to London in September and I couldn't be more excited! all beautiful cities. i've never been to berlin and that's on my places to go list. London and Berlin I was.. But the other now and I would liek too. Are amazing, Have a nice day. Berlin! I'd love to be there. I want to visit NY too. Your blog is really amazing. I follow you. I hope that you follow me back. I would like to visit them too. I want visit them all! !